Back when I was a teen and read my first Islam related book, I immediately fell in love with it. It was about Prophet Ibrahim (as). Through this story my love for Allah grew, which alhamdhulillah eventually helped me turn to Allah. My heart remains full of gratitude to Allah for allowing me to find an Islam I was so unaware of. I, like many others grew up within a cultural Asian household where I understood Islam to only be something ritualistic we have in our lives. A more detailed previous post talks about this. I now want my daughter to grow up loving Allah from a very young age. I want the love to be second nature to her, imprinted in her heart and mind. And one of the main ways of doing this is to get her to know and love the words of Allah, the Quran. Yusra only just turned 2 and her speech isn’t very clear yet. From the day she was born I have used routine to introduce anything new to her, be it food, bedtime, play etc. She is very calm and usually pays attention to detail. Obviously, she’s still very young for me to know what style of learning will best suit her. But for now I feel she learns better with short but regular detailed play. Here are some of the little things I’ve done with her to introduce the Quran and the Arabic alphabets. I’ve seen many other mums teach their children through play and I’ve now become a firm believer in learning through play. Almost everyday I think of ways to expose Yusra to the words of Allah through play. 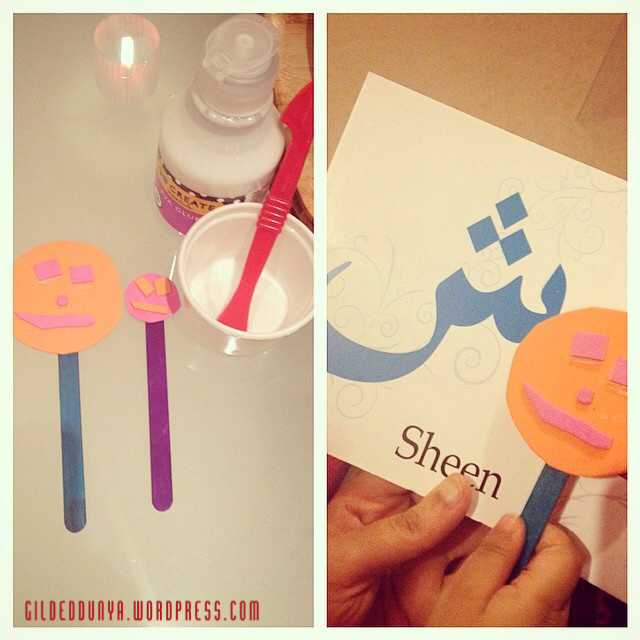 We made these sticks to use when reading Yusra’s Arabic alphabet book. They were meant to be happy faces but when she was finished glueing the bits, they looked like little monsters – but it’s alright as she thought they were lovely. I let Yusra hold them when I’m reciting a surah from the mus’haf to her and tell her to point at the words. She loves it and loves taking part in this important task! I put the sticks away (away from Yusra’s reach) after we’ve finished with the book or the mus’haf, as I feel this makes the stick more special and something we associate with learning Allah’s words. 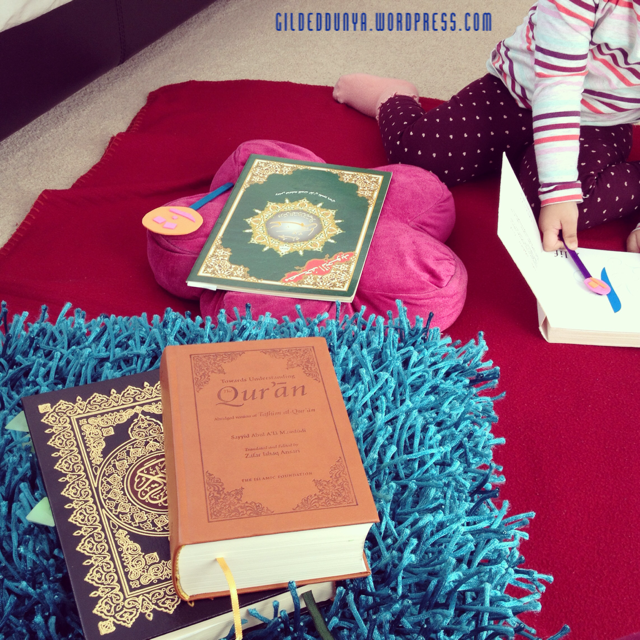 For a month now, Yusra and I have been sitting down to look at the Quran. We do this Monday to Friday for no more than 10 minutes in the mornings. I usually go through her alphabet book (with the stick) and then recite a surah from Juzz amma. Most days she listens attentively, but other days she starts doing other things – which isn’t a problem at her age, it’s the regular exposure which is important. If Yusra goes off and starts playing with something else, I remain seated and usually recite some more Quran. This is to make sure I don’t give up just because she has wandered off. Sometimes one of the best ways to teach as a parent is to discipline ourselves to see through what we’ve planned. Our seating is made up of a throw on the floor and couple of cushions from the sofa. Every day I let Yusra pick her own cushion and for some odd reason she finds this part very interesting. Alhamdhulillah since we started our little sessions, it’s been a lovely 10 minutes of our day and it somehow brings an amazing positivity into my day in general. After reading some mums discussing bedtime routines, I’ve now introduced this recitation as part of Yusra’s bedtime routine. Before, I used to just recite to her but now I play this CD about 30 minutes before her bedtime. She usually shouts out ‘Allah, Allah’ a few times when it is playing. I’ve been using an alphabet puzzle for a while now and it’s been brilliant at helping Yusra recognise the different letters. So now I’ve started to play a new game using the puzzle, where I ask Yusra to pick one of the letters and find them in her book. She loves doing this and it just helps bring a variation in learning the alphabets. And lastly, I haven’t yet but will introduce these flash cards to Yusra. As with all types of flash cards, I’m hoping to play different games with her using these. I printed them off from this lovely website full of resources, after another sister recommended the site and I loved it. 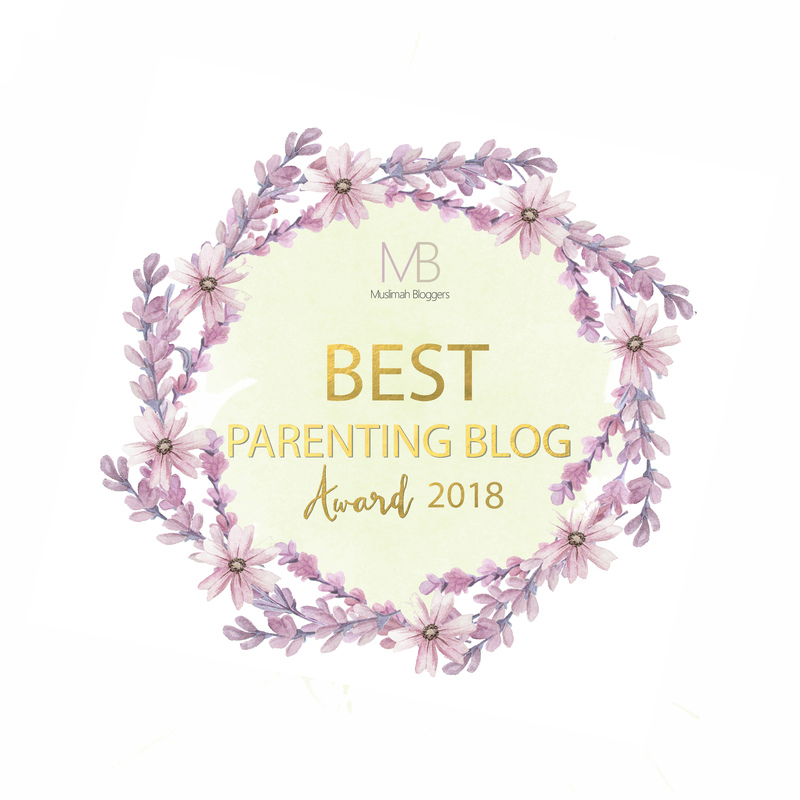 This is not an educational post as such, just ideas to share with other mums like me. There is no doubt that as parents we will all fall short on the Day of Qiyamah in regards to the upbringing we give our children. This may not always be intentional, but more due to our own lack of Islamic education. We can plan and try to give them the best, helping them to grow up to be dear slaves of Allah. These little things I’ve started to do is in hope that they aid in helping my daughter love Allah and for my time to remain as witness that I tried. In the below hadith Qudsi Allah uses the most beautiful words to tell us exactly how close He is to us, but it is down to us to seek that closeness. SubhanAllah, these are mine and Yusra’s baby steps to draw nearness to Allah, May He come to us with speed. May Allah help us with our responsibility as parents. Alhamdhulillah you liked the ideas. If you’re in the UK – try Islamic Impressions online or if you’re in London or Birmingham, their stores. 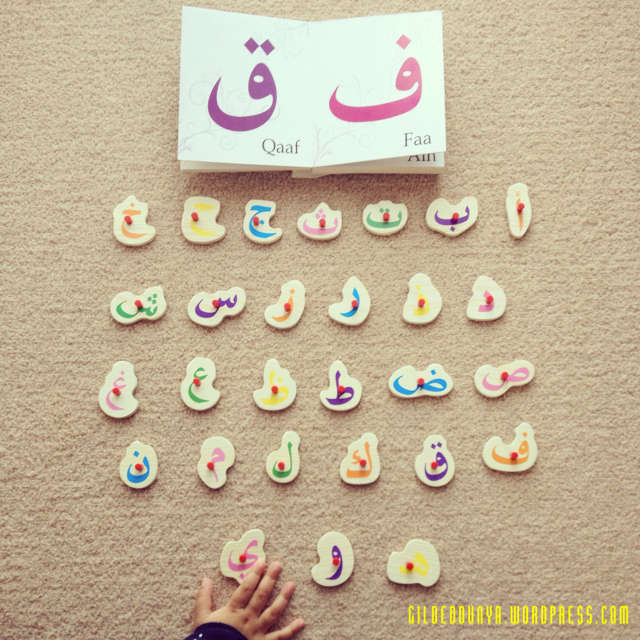 I got a lovely Arabic alphabet board book for my daughter. It is the one in the pic with this article. Sis, if you’re on Instagram or Facebook – you can search for me Gilded Dunya – I share lots of things through them. salam. alhamdullilah sister nice post. i personally feel there is less islamic materiel available for toddlers. i always thought of reading a bedtime story of prophets to kids is a good idea but its hard when thy are young and cannot understand much at that age but your ideas are very good n inshAllah will try with my 2 year old. This is such a helpful post and I am so glad to have come across it. 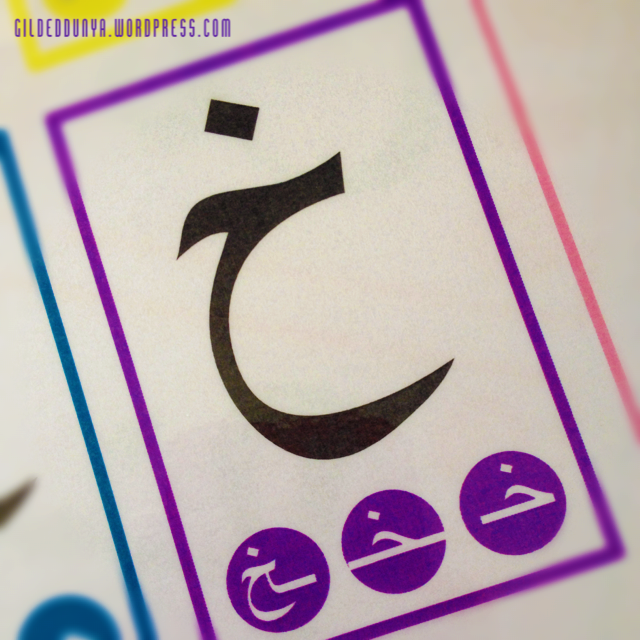 I’ve recently got an alphabet puzzle for my son and he is able to put that in the correct places but I still need to help him recognise the arabic alphabets. May Allah reward jannah my sister. Just Allah know how much I respect you and love you because I benefit a lot from you.